Scotland women's coach Anna Signeul has announced an experienced squad for the opening Euro 2017 qualifier against Slovenia on 8 April. Four of the 19 players selected - Gemma Fay, Kim Little, Joanne Love and Leanne Ross - have over 100 caps each. Two more players will be added to the squad next week. Scotland lead their qualifying group by three points with four wins out of four and four matches to play, including two against nearest challengers Iceland. Manchester City's Jane Ross is the top scorer in Group 1 with six goals and is included again by Signeul. 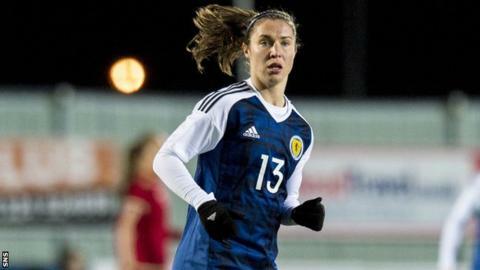 Chloe Arthur and Lizzie Arnot, won won their fifth and sixth caps, respectively, in the 1-1 friendly with Spain, also keep their places in the squad. After Slovenia's visit to the Falkirk Stadium next month, Scotland host Iceland on 3 June before travelling to face Belarus on 7 June. Signeul's team complete their qualifying campaign away to Iceland on 20 September. Group winners and the best six runners-up will qualify for next year's finals in the Netherlands. A play-off between the other two group runners-up will decide the final team to join the Dutch hosts for the 16-team tournament.